THEY MADE ME A CRIMINAL (Busby Berkeley, USA, 1939, 6) — Title doesn’t make much sense, in this remake of an early-30s Douglas Fairbanks Jr. vehicle (THE LIFE OF JIMMY DOLAN) about a champion fighter who mistakenly thinks he kills a sportswriter and has to hide out at a matriarchal ranch out west, run by two women overseeing a bunch of kids. After all, he ISN’T driven to crime by his cruel fate or the machinations of others, as Paul Muni was in the similar-sounding title I AM A FUGITIVE FROM A CHAIN GANG. 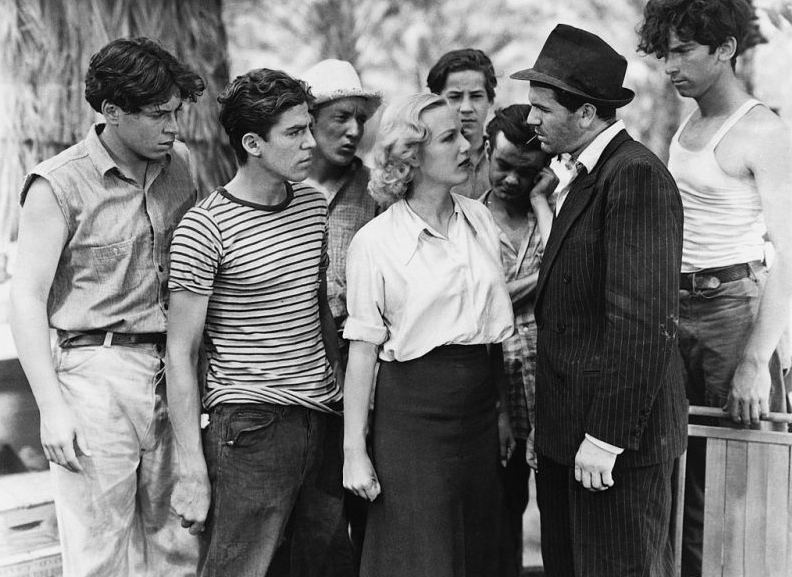 John Garfield is a far more believable proletarian tough guy than the too-refined-for-my-taste Fairbanks; unfortunately that casting gain is more than offset by the fact the hard-as-nails New Yawk cop pursuing the killer-boxer to the end is played by Claude Rains … (vjm waits while people stop laughing) … really … (more laughter) … all right, folks, calm down … (people recover) … CRIMINAL also is hurt by comparison to a much better boxing movie Garfield made later — BODY AND SOUL. Still, the film is saved, I think by some supporting roles and casting choices — May Robson has a lot of fun as the Tough Old Granny who cheers her boy in the ring and will sock anybody who doesn’t cheer him too. It also had the Dead End Kids at the ranch, taken in from a reform school (they were disabled kids, and my memory says younger ones, in the 1933 film). A fighter on the lam playing pater-familias would matter more to borstal boys than handicapped ones. A scene of Garfield and the Dead End Kids apparently trapped in a water tower is probably the film’s high point. It was also coincidentally ironic to see the opening fight, which Garfield wins and then, in his victorious radio interview, calls out to his mom and plays the good boy. Very quickly, we learn he’s living the high life with euphemized call-girls and booze in hotel rooms, rather than home with mom (Tiger Woods, anyone). Also, the way the final fight plays out, against a take-all-comers pro, is more realistic here than in JIMMY DOLAN. Though again, to compare, the overmatched “other guy” in the locker room in CRIMINAL is an epicene nobody; in DOLAN, it was a young John Wayne. It just means more in retrospect to see The Duke go off to his fight as if to his execution, stiff with not-too-well-hidden terror. But what matters in the end, and which makes HENRY V work overall, I think better than Olivier’s 1944 film, is Branagh’s greater commitment to realism and making the Shakespearean dialogue come across as naturalistic. His personal performance is great and lusty and virile, and therefore the film grabs you right away because Branagh sells with a straight face all the court intrigue over his claim to the French throne (but with a gentle mocking “so, it’s clearly the case” from his courtier at the end). The opening scenes don’t sound the least bit stylized, and so we’re off to the races. This makes the tennis balls from the Dauphin come across as both funny and horribly, terribly misguided — “you don’t tug on Superman’s cape … you don’t pull the mask off that ol’ Lone Ranger” is how Jim Croce expressed roughly the same thought I had. And when we get to the big speeches — “once more into the breach” and “we band of brothers” — you’re just in the presence of Branagh’s greatness as an actor. Part of it, essential to the rousing, loin-girding grandiosity of the St. Crispin’s Day speech, is Branagh’s supreme confidence, which becomes Henry’s. Branagh encourages us to go along with him as Henry rallies his outnumbered men, both men knowing how good he is and how he’s gonna nail for posterity his defining moment, whether it’s Agincourt or one of the most famous speeches ever written in English. GEORGY GIRL (Silvio Narizzano, Britain, 1966, 3) — Surprised by how much I disliked this film, a labored unfunny quirkfest that answers the question “what would Wes Anderson have made if he had been a film-maker in 1960s Britain.” Pauline Kael titled her review of this film “so offbeat we lose the beat,” which isn’t wrong, but I think the problem is more fundamental. Both the Charlotte Rampling/Alan Bates characters and the drama of their relationship are too detestable and selfish to let the film work as serious drama. I wanted to crawl under my covers during the baby scene at the hospital. But on the other hand, Lynn Redgrave and James Mason (again, both the characters and their relationship) were too straight and goody-goody to let the film work as a (very dark) screwball comedy. And Kael is right, at the end of day, GEORGY GIRL is just a complete mess, managing the feat of being tonally all over the map while somehow hitting the wrong tone every time. Still, I could spend a whole hour just replaying the opening scene. The credits roll to the Seekers’ “Georgy Girl” while Redgrave gets a new hairdo and recapitulates both the Seekers’ lyrics and the difficulty her character will have in living out their exhortation to jump right down from the shelf (a little bit). This is true both of that scene (she hates the hairdo) and the movie overall (she didn’t really want a man, but a baby — that’s the only way the ending makes sense). And Judith Durham’s voice goes down smoother than black-label whisky. Forgive the anachronism, but the opening scene is a near-perfect music video that could have been on rotation on MTV in the 80s (black and white, and the retro look were both “in” at various times). And if I hadn’t known, I’d never have guessed that Georgy was Lynn Redgrave (even from closeups). Knowing of Redgrave from the late-70s, it would never have occurred to me that she once played a homely girl. HIGH SOCIETY (Charles Walters, USA, 1956, 4) — Again I was surprised by not liking this movie — a semi-musical remake of THE PHILADELPHIA STORY starring Grace Kelly, Bing Crosby and Frank Sinatra. Now, also like GEORGY GIRL, HIGH SOCIETY gets off to a crackerjack start with a musical number that foreshadows the plot. 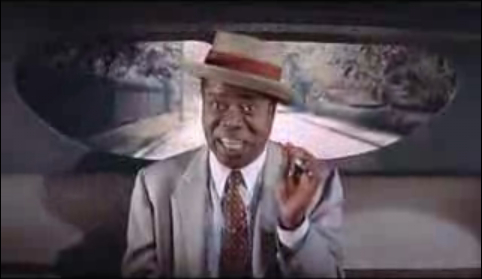 Louis Armstrong and his orchestra do “High Society Calypso” while on the bus, heading out for the central characters’ estate. But the scene is … not exactly a false promise but actually too true — it sets up why the movie fails. HIGH SOCIETY seemed almost machine-tooled to demonstrate why 30s and 40s movies were so much more awesome than those of the 50s, a point underlined in retrospect by the opening number, sung by a man whose career stretches back even farther, into the 20s. Now THE PHILADELPHIA STORY is far from my favorite screwball comedy, but, still, every casting change is a step down from the original. Grace Kelly is better-looking than Katharine Hepburn, but I don’t think she was ever a good actress for anyone other than Alfred “most overrated” Hitchcock. Kelly doesn’t have the strong will of the screwball heroine (oh, to see Hepburn do BRINGING UP BABY in this staid movie). Nor can Kelly do the rough, curt snobby edge that Hepburn could give her finishing-school accent; she was just too smooth and nice. And to go from Cary Grant to Bing Crosby … yes, Crosby can sing better than Grant (more on that anon), but he IMHO is just charmless and stiff-straight as an actor. It’s a crime to invite comparison of Crosby with the man with the highest combined quotient of bantering charm and dry roguishness in movie history. After all, what is THE PHILADELPHIA STORY/HIGH SOCIETY about if C.K. Dexter Haven isn’t a rogue? With Jimmy Stewart recast as Frank Sinatra, the opposite is the problem. Sinatra was best when he had a rough, working-class edge, not when he’s straight-jacketed among these squares in this role. Clarification: My point about the unfavorable comparison between Crosby and Armstrong wasn’t really to accuse either the film or Crosby of racism. It was strictly a musical comparison about how much better Armstrong is as a musician, how much more charismatic and interesting a stage performer Armstrong is (IMHO), and how musically absurd it is to have Crosby introduce Armstrong in a jazz number. Hence the Wonder bread, Vanilla Ice and Pat Boone comparisons. It obviously needs no saying that Armstrong was patronized in this role, his musical talent shunted to the side in that scene, and his band used in HIGH SOCIETY as a (still awesome though) dramatic framing device. Hence the Nat X and “back of the bus” lines, since those decisions reflect the socially-acceptable racism of the time. I know that Armstrong and Crosby were friends and mentors in real life and I’m not generally in the cheap-moral-posture business of slagging old movies for reflecting social attitudes of the time that nobody now defends. You might want to rethink the Bing criticism, especially in comparison to Armstrong — since Louis himself was a huge admirer of Crosby. Terry Teachout, in his new bio of Armstrong deals with this. The two men had known each other since the late 20s and Teachout convincingly argues that while Armstrong had an influence on Bing, Bing also had an influence on Louis. Jim: I wrote the clarification while you posted, prompted by a Twitter discussion with Gerardi, where he also told me about the Teachout biography. I admit to not having much familiarity with Crosby’s non-movie music. But between this film, seeing the Father O’Malley films, and only seeing one of the ROAD pictures — Crosby’s appeal as a singer and actor has mostly eluded me. Maybe the Vanilla Ice comparison is excessive (it is … Crosby was no flash-in-the-pan), but that’s really how that particular HIGH SOCIETY clip I posted came across to me.